Monica Maschak - mmaschak@shawmedia.com Wheel Werks Bikes owner Bob Olsen, will ride this custom-built bike 500 miles over the Andes Mountains before donating it to a child. 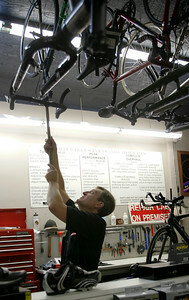 Monica Maschak - mmaschak@shawmedia.com Bob Olsen unhooks a bike from the ceiling of his store, Water Werks, in Crystal Lake. He will be riding this bike over the Andes Mountains as part of Pacific Atlantic Cycling Tours. 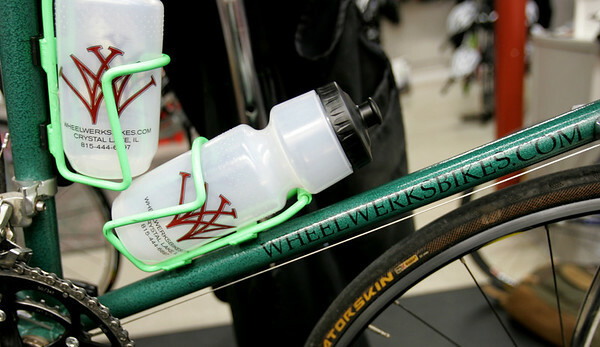 Monica Maschak - mmaschak@shawmedia.com Wheel Werks owner Bob Olsen, 44, of Crystal Lake applies a decal of his business to a custom-built bike he plans on taking to Peru as part of a humanitarian cycling tour. 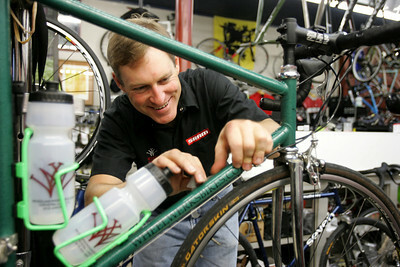 Olsen will ride this bike on a 14-day tour with the group Pacific Atlantic Cycling Tours. He will donate the bike to a child in Lima, Peru. PAC will also be helping rural villagers get clean drinking water.